The top 2 photos are one inch flanken-style short ribs cut from the chuck(shoulder) section of the short ribs. Short ribs cut from the chuck section are meatier, usually have about 1 inch to 1 1/4 of meat above the bones. Thick cut ribs are best used for a braised short ribs recipe. The above photo on the left is flanken-style short ribs cut 1/4 inch thick. The above photo on the right is English-style short ribs. English-style are cut between the bones giving them a rectangle shape and usually have about an inch of meat above the bone. Short ribs can be cut from different sections of the 12 ribs extending from the chuck(shoulder), the loin and the plate(belly). Most butcher shops and grocery stores don't distinguish which section the short ribs are cut from. Short ribs are fatty but very succulent with a great beefy flavor and are popular in many Asian dishes. In many grocery stores, short ribs are sold as flanken-style or English-style ribs. Flanken-style are cut across the rib bones, if grilling this style ask the butcher to cut them 1/4 inch in thickness, one inch short ribs are better suited for a slow-cooked braising method. English-style are cut between the bones giving them a rectangle shape and usually have about an inch of meat above the bone. 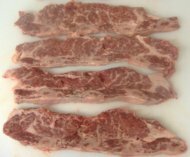 If you can not find short ribs 1/4 inch in thickness click here to learn how you can cut them yourself at home. Purchase short ribs with at least one inch of meat above the bone. Short ribs work well with marinades but are not necessary as long as they are under a half each. Grilling ribs 1/4 inch in thickness are very succulent and tasty on their own by just adding some salt and pepper with an optional bbq sauce brushed on the last 1-2 minutes of grilling. 1. Trim any fat or silver-skin off the surface of the ribs. Season both sides of the ribs with salt and pepper. 2. Preheat grill to medium-high with lid down about 10-15 minutes. Scrape grill clean with a brush. 3. Grill short ribs 2.5-3 minutes per side with lid down for med-rare and 3-3.5 minutes per side for medium doneness. Transfer ribs to plate, tent loosely with foil for 5 minutes and serve. 2. Build a single level fire with hardwood charcoal, burn until the coals have a thin layer of gray ash, scrape grill clean with a brush. 3. Grill with lid open 2-2.5 minutes per side for med-rare and 2.5-3 minutes per side for medium doneness. Transfer ribs to plate, tent loosely with foil for 5 minutes, serve and enjoy this short ribs recipe. Keep a spray bottle handy for flare ups. Always use an instant-read thermometer to check the doneness of a steak. Stick the thermometer through the side of the grilled steak deep into the meat but not touching the bone or fat. To avoid flare ups, trim steaks closely, leave only thin layer of fat to preserve juiciness. Keep a spray bottle handy for flare ups. If using a gas grill, cook with lid down for best flavor, for more even cooking and energy efficiency. Keep lid open when grilling with charcoal.